These wonderful lightly risqué luxury playing cards, with lots of lace, in the style of the 1900s, were designed by Pierre Albarran, drawn by Monique Arietti (pseudonym of Gabriel Garachon, designer at Draeger Frères who printed the cards, and herself a dancer) and published by Éditions Philibert of Paris in 1956. 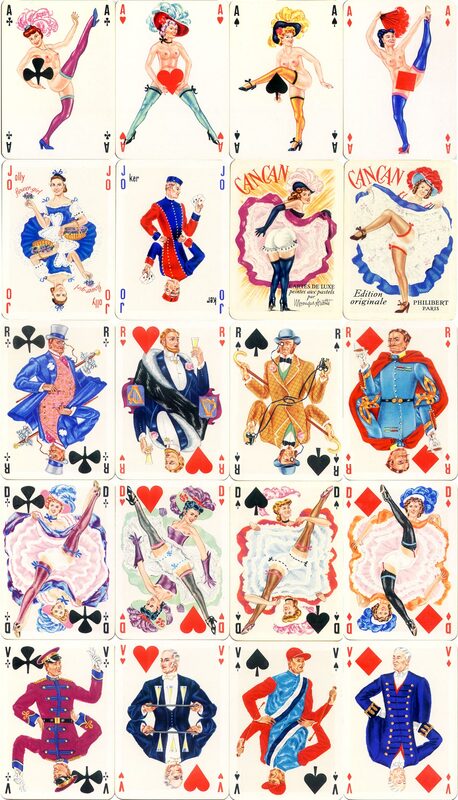 Above: lightly risqué “Cancan” luxury playing cards designed by Pierre Albarran and published by Éditions Philibert, 1956. 52 standard cards plus two Jokers and additional 4 Aces + 2 title cards. Gilt edges. Images courtesy Barney Townshend.